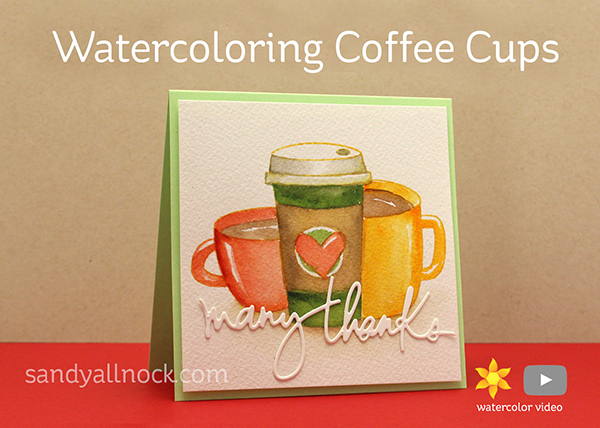 The cute cups in this stamp set by Right at Home are large – easy for coloring – but have thin lines; that gave me the idea to use them for some no-line watercoloring. I used a distress oxide (an ink that dissolves a little with water) to stamp it. Watch the video below or click HERE to see it in HD on YouTube. And did you know what today is? Artist as Outlaw Day! How should we celebrate!?? Having trouble finding QUIN BURNT SIENNA… would someone point me in the right direction? Thanks. I’ve enjoyed all three coffee videos—lots of great ideas. what you post on your blog gives me *hope* for my future of coloring & blending. the cups & coffee are incredibly colored ; thank you for your maintenance of your blog….a lot of hard work!! Love this! As always… I will watch you watercolor anything!! Please do a not coco mug! I toooo like Tea more than Coffee, but your card – as always – is just gorgeous. I always love to watch you do your magic with watercolours and da brush. Love coffee, love watching you do your magic, love this card… Oh, and while we’re on the subject of coffee cups – you probably knew this, but I’ll mention it… The Fiestaware company brings out a new color every year, and in 2017 it was Y-17! Of course, they don’t call it that – they call it “Daffodil”, but I had to have one of their mugs, and it’s a perfect match – you should have one of those if you don’t already – you know, for your cocoa! Have a sunshiny Y-17 sort of day!